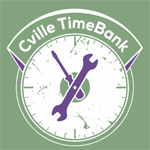 We need just a little information to set up a member account for you in the Cville TimeBank. After you click 'send application', you'll receive some additional instructions. We ask that new timebank members come to an orientation and sign a member agreement before the coordinators will authorize access to the member site. We hate for this to be a hassle, really, but we want to be sure all our members know how the timebank works -- and, we want to meet you and help get you started! Thanks for understanding! You'll find an up-to-date schedule of monthly orientation sessions on our website - please click for details.